Because search engines are looking to return relevant results when someone performs a search. The closer the words on your web page, blog post or online video are to the search that was just performed, the more likely you are to rank higher for that search. Higher rankings mean more qualified traffic. In fact, a recent study showed that the number one result averaged a 36.4% click through rate (CTR.) The second place result only managed 12.1% CTR, and the CTR declined with every subsequent result. Although using the right keywords isn’t the only reason why your page ranks well or poorly–the quality and quantity of inbound links is important, too–it’s one of the easiest variables for you to affect. How do you perform a keyword analysis? Brainstorm: Whether by yourself, with team members, or trusted customers and clients, you should start by brainstorming a list of your best keywords. These would be the words you think your ideal customer would use when searching for a product or service like yours, or phrases you’d like to rank well for. Anything from “Boston tax accountant” to “how do I write off a business expense?” I talk about using five perspectives to generate the best keyword phrases. Test: After you generate your keywords, you’ll want to determine if they actually will bring you enough traffic. Often, we’ve been in our industry for so long we use jargon that our prospects don’t use. Or, we are missing out on new, related phrases that could attract new customers. Using a tool like Google Adwords Keyword Tool will help you determine which words and phrases are most likely to attract the most qualified traffic. By entering your phrases into this free online tool, you can discover how much competition you would have from other sites to rank well for a phrase, as well as how many people are actually searching for that phrase. In addition, GAKT will provide a lot of related phrases that may perform better than your original list. Rewrite: Once you have your list of your best keywords, get to work putting them in strategic places on each page of your site, including the page title, any headers or subheaders, early and often in the body copy, as well as in the intrasite links from one page to another. Improved search engine visibility rarely happens overnight. Continually adding new, keyword rich content to your blog or website over time will improve your search engine ranking and attract more qualified traffic to your site. Two reports in Google Analytics can help determine if this is happening. The first can be found at Traffic Sources > Search Engine Optimization > Queries. This report shows your site’s average ranking for any keyword that “resulted in impressions, clicks and click-throughs.” You can see if you’re moving up or down over time. The second report can be found at Traffic Sources > Search Engine Optimization > Landing Pages. This will show you how your individual pages are fairing from a search engine standpoint. Finally, take a look at your overall search traffic and the number of leads you’re generating from your website. If the number of leads you’re getting a month is increasing, your work is making a difference. This entry was posted in Analytics & Insights, SEO, Web Marketing Glossary by Rich Brooks. Bookmark the permalink. This is a great article. Just the information I was looking for! Great overview – just enough to draw attention, present information, without giving away the farm. Thumbs UP! Thanks! Although I’m happy to give away the farm. 🙂 I just wanted to create a series of explanatory posts that I can link to in future posts for people who want to dig deeper. A Marketing Agents appendix, if you will. Thanks, Lenny, I appreciate that. If there’s anything you’re struggling with, either let me know here or through the contact form. I’m always looking for new topics to write on. I’ll definitely be putting up some stuff on Facebook here in the next week or two, and some posts on how to measure social media ROI sounds great. Thanks so much for the suggestions! Will be on the look out for it and great weekend for you as well. 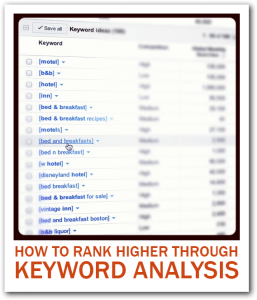 Should you have Tier 1 keywords & Tier 2 keywords? Is there a limit also to how many keywords you should have? That’s a great question. As far as the research goes, I don’t prejudge keywords so I wouldn’t use a tiered approach…I would just throw them all in there and see what works. As far as the content creation goes, I generally focus on one keyword phrase per page or post. However, I might come at it from different angles. So, if I’m trying to rank well for “Maine coastal real estate”, I would use that term, but also “coastal real estate,” “Maine real estate”, “Maine waterfront property” and so on, assuming they were all well-tested keywords. What type of business are you running? What type of things are your customers looking for? Start there. If you’d like some personal help, please reach out to me using the contact form (it’s in the navigation bar above) and I’ll see what I can do.